Picture the scene. A bunch of smiling cousins spiffed up in classic straw hats purchased that morning at the Charleston City Market. 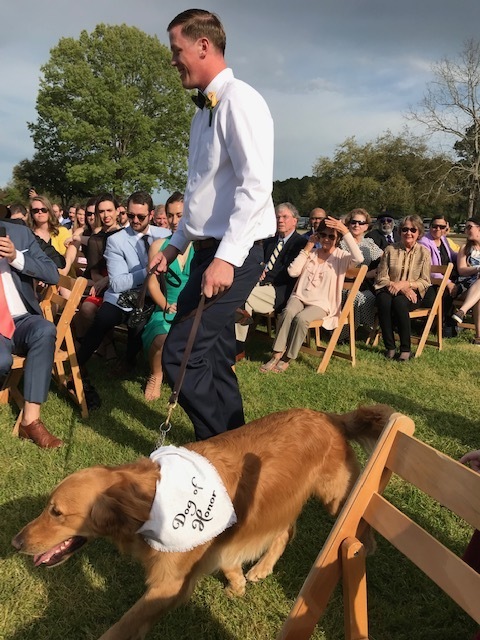 A Golden Retriever named Rosie being escorted down the aisle by a bride’s brother to serve as the Dog of Honor. 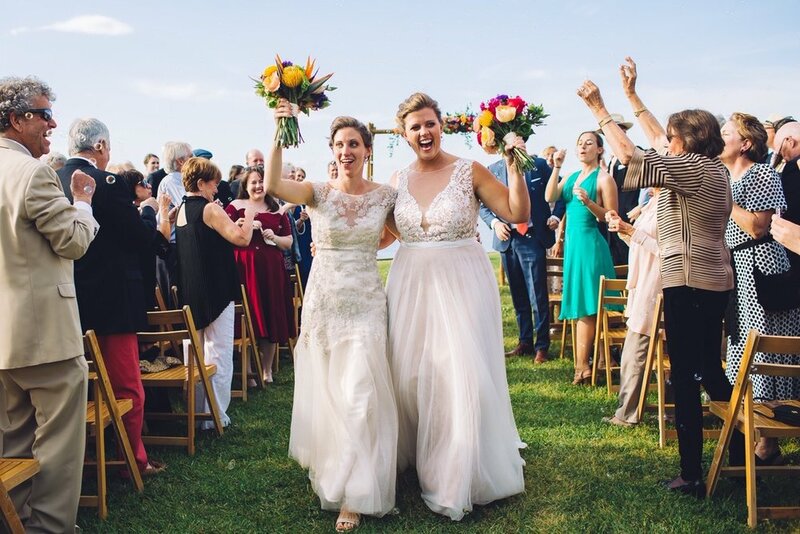 A flower-festooned wedding arbor overlooking the Stono River at dusk, plus 200 happy guests who came to South Carolina for this late March wedding. Here comes the bride! Well, actually, make that two. Eileen Burkhardt, my niece, and Caroline Walker, her betrothed, were married last Saturday. They met six years ago as undergraduates at South Carolina’s Elon University. After graduation, they moved to Charleston, found employment and bought a sweet home right in the heart of it all. Last summer they quit their jobs to drive cross-country on a blissful four-month trek, visiting friends and family from Las Cruces, New Mexico to Portsmouth, New Hampshire, among countless other stops. Rosie the Retriever joined them on every mile. Then it was back to Charleston to plan a wedding. What a truly gay event! The smile on a father of a bride was so big, you’d swear the Colorado resident was enjoying a Rocky Mountain high. Guitar music played as Eileen walked down the aisle, arm in arm with her parents. 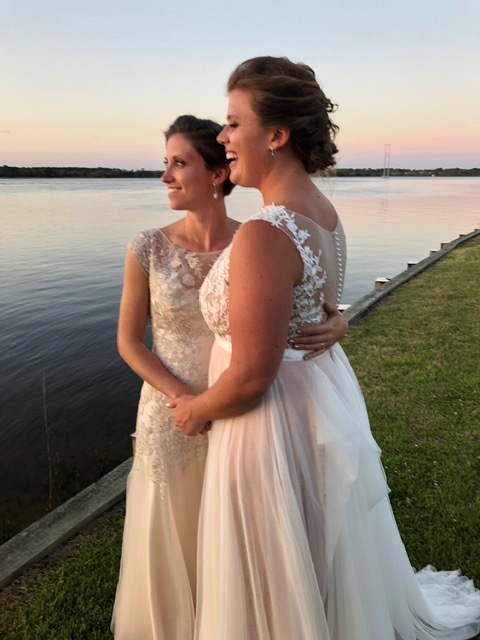 She couldn’t stop grinning at the wedding guests, then burst out, “You all look so beautiful!” A fishing boat zipped along the Stono River at mach speed until, apparently, the captain spotted the two brides. He slowed down and TOOT TOOTED twice. Everyone cheered. Each bride wore a beautiful lace dress, but neither had seen the other’s. Shortly before the ceremony, the girls were led outside to the lawn and stood facing away from the other. 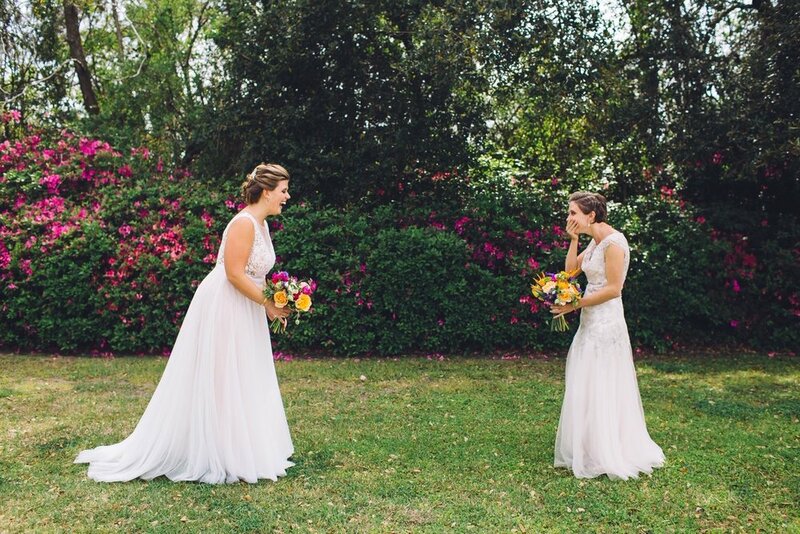 When Caroline turned to see Eileen’s dress for the first time, the photographer caught the special moment. A sign read: Pick a seat, not a side, because either way it’s for the bride! The wedding officiant spoke for us all when she said, “Marriage is a choice. You have each found a partner. And we can see the future in your eyes.” We blinked back tears and stifled giggles during the time-honored vows (“I promise to turn the light off last!”) and the exchange of rings.